-- Recruitment of Management Trainee (Internal) of Telecom Operations in BSNL. --Advertisement inviting application for the post of Chairman and Managing Director, Bharat Sanchar Nigam Limited (BSNL). 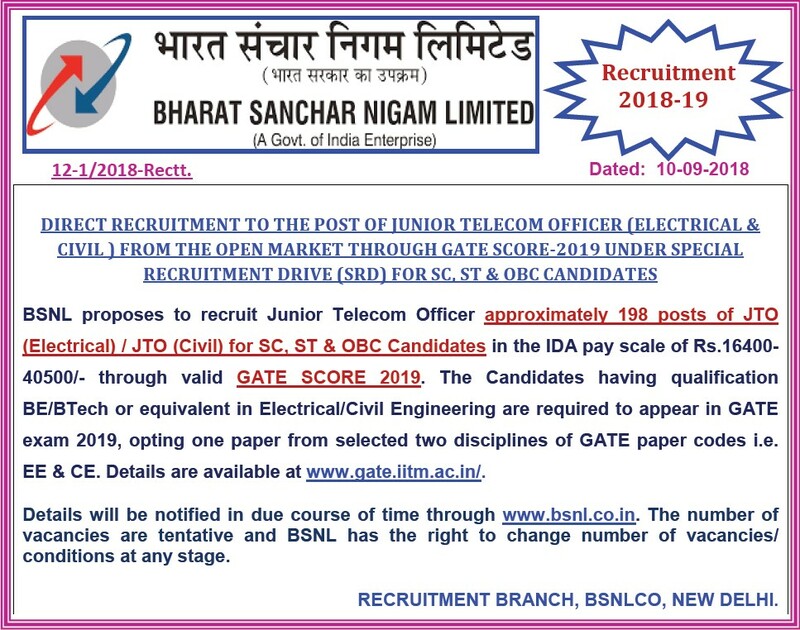 --Recruitment of "Graduate Engineer" to the post of Junior Telecom Officer (Civil & Electrical) from the Open Market through GATE Score-2019 under Special Recruitment Drive (SRD) for SC, ST & OBC candidates. The above said recruitment is to be done through GATE Score Card and Gate registration process has started from 01/09/2018. --Procedure for appointment to the grade of Executive Directors (ED) in BSNL through immediate absorption basis. -- Policy for empanelment of IOs from willing Retired DoT/BSNL/MTNL officers of level of Deputy Secretary or above of Dot or DGM of BSNL/MTNL. -- Fake/bogus letter of Award for Comprehensive Contract for passive infrastructure of BSNL Telecom Towers to M/s D.M Logistics, New Delhi.